This is the heart of your village. Upgrading your Town Hall unlocks new defenses, buildings, traps and much more. Protection of the Town Hall is critical for achieving players’ objectives. Placement of the Town Hall outside a trophy pushing base or farming base serves no purpose, other than to rapidly drop Trophies. Players should aim to protect their Town Hall at all costs, as it contains a lot of all 3 different Resources. If players are designing their War Bases, they should aim to protect their Town Hall at all costs. If an attacker is unable to destroy the Town Hall, he will get a maximum of one star. However, at higher Town Hall levels (especially Town Hall 8) players can, instead of protecting their Town Hall at all costs, use their Town Halls as a high hitpoint damage sponge – similar to Storages – as part of a strategy to prevent 3-star attacks from Dragons and other high level armies, at the cost of making 2-star attacks much easier. 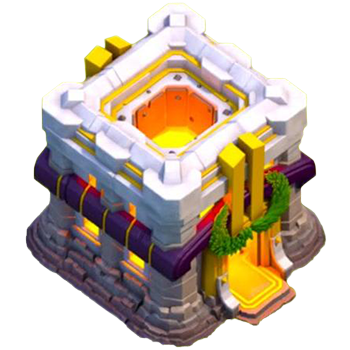 Placing your Town Hall within the range of your most powerful Defenses can give it the most shots to destroy attackers. It is suggested that you upgrade everything you possibly can (e.g. Troops, Buildings, etc.) before upgrading the Town Hall to the next level. Prematurely upgrading (rushing) your Town Hall is extremely risky, and it will take months to upgrade your buildings/troops to match your Town Hall’s level. Raiding with low level troops will also become increasingly difficult. If maximizing your builder time is important to you, it is inefficient to wait until literally all of your building upgrades are finished before beginning the Town Hall, as all but one of your builders will be idle for the duration of your Town Hall upgrade. In order to keep all of your builders occupied (but ensure they are all available when the Town Hall finishes) you should plan for the Town Hall upgrade to finish just as the remaining builders are finishing their final projects. For example, if you are currently at Town Hall level 7 and have three builders, you should upgrade your Town Hall (which takes 8 days) when the total remaining upgrading time of other buildings approaches 16 days. Don’t place your Town Hall in a corner surrounded by Walls, troops can still be placed next to the Town Hall. The Town Hall building size on the map is 4×4 Titles (one of the largest buildings in the game). * Max Buildings Available is including the Town Hall itself, all the Traps and 5 Builder’s Huts. Town Halls have the highest hitpoints of any Building, with the exception of Walls, which means they take a long time to destroy. 5 level 7 Lightning Spells can destroy Town Halls of level 6 and lower. Using 5 level 7 Lightning Spells and 2 level 4 Earthquake Spells (with one donated from the Clan Castle) can destroy a Town Hall of level 8 or lower. The lava in the level 10 Town Hall may be a reference to the fact that the Inferno Towers are unlocked at this level. When a level 10 Town Hall is destroyed, the ruins are lying on a grate on top of lava. However when a level 11 Town Hall is destroyed, the ruins are the same as Town Hall 1-9’s ruins. There was a mistake in Clan Wars with the level 4 Town Hall. If there is a Town Hall 4 war participant, the war map will show a level 5 Town Hall, rather than a level 4 one. However, if that player is visited, it will show that he/she is Town Hall 4. The glitch was fixed as part of the February 2015 update. The level 11 Town Hall was added as a part of the December 10, 2015 update. This same update also made the town hall a resource building, and can now be targeted by Goblins. Also, Town Hall Level 10’s cost got increased from 4,000,000 to 5,000,000 in the same update. 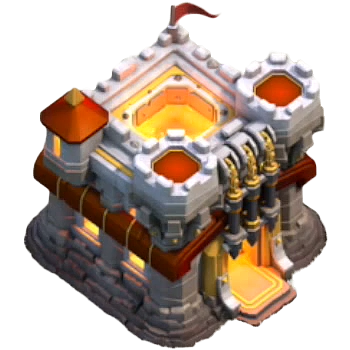 The level 10 Town Hall was added as a part of the May 23, 2013, “Fiery Fortress” update (Version 4.14). 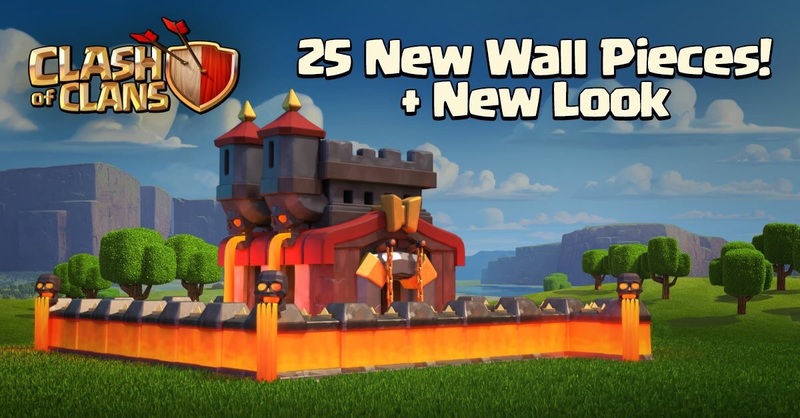 The level 9 Town Hall was added as a part of the October 27, 2012, “Dark Castle” update (Version 2.86). The levels 1-8 Town Halls were added in the original release (date varies depending on platform and country). Between November 24 and December 8 of 2014 and 2015, IOS users were able to purchase (RED) Gems to contribute to AIDS research. When they did, they received a red shield on their Town Hall. There is a glitch where if a Town Hall upgrade finishes during a Clan War Preparation Day, it still shows that the player is still the previous town hall level. If you zoom in on your town hall entrance, you will see the glow of a fire inside the entrance. All Defensive Buildings (except the Hidden Tesla, Air Defense, Air Sweeper, Inferno Tower and Traps) face away from the Town Hall. In an older version, players can sell Buildings but was removed due to it being unnecessary. Town Hall 11 had a beta design before it got changed to its released design. On Town Hall 11, there are two front towers that dominate the entrance, but in the back there is a roofed tower for an unknown reason. The Town Hall is small when compared to villagers and builders. – Tapping this icon displays information about the building, such as its name, level, durability (hitpoints) etc. At the bottom of the screen briefly describes its purpose and provides tips for using. – Tapping this icon begins upgrading this building to the next level, if you have enough Resources and a free Builder. When the building is at maximum level, this icon is not shown. – Tapping this icon, which is displayed only while an upgrade is in progress, instantly finishes that upgrade at the cost of the displayed number of Gems. To spend the Gems thus is not recommended. – Tapping this icon, which is displayed only while an upgrade is in progress, cancels the current upgrade and refunds half of the upgrade cost. To cancel the process of upgrading and to lose thus half of the Resources spent is not recommended. – Tapping this icon re-arms all Traps. This icon is only displayed when one or more of your Traps have been triggered in a previous enemy attack. – This icon cannot be tapped, and is only displayed when all of Your Traps are armed. – Tapping this icon reloads all X-Bows with Elixir. This icon only appears if one or more X-Bows is not fully loaded. – This icon informs you that all X-Bows are fully loaded. It is not tappable, and replaces the Load icon. – Tapping this icon reloads all Inferno Towers with Dark Elixir. This icon only appears if one or more Inferno Towers is not fully loaded. – This icon informs you that all Inferno Towers are fully loaded. It is not tappable, and replaces the Load icon. The Inferno Tower damage rate resets to the minimum each time it switches targets.